I had never attempted puff pastry or picnic eggs but I did both last week-end for a picnic we were taking to the river. Being the royal wedding bank holiday, I wanted to put together a very British luncheon and I decided to try and make my own sausage rolls and picnic eggs. I will give later the recipe for puff but today I’ll share my freshly acquired know-how about turning out some very tasty picnic eggs. A world away from the gritty, dry version I used to buy from supermarkets. First boil the eggs for 3 to 4 min. then cool them down in running water and peel them. I prefer to have them slightly soft boiled at this stage because they will cook a bit further later on and you don’t want them too dry. 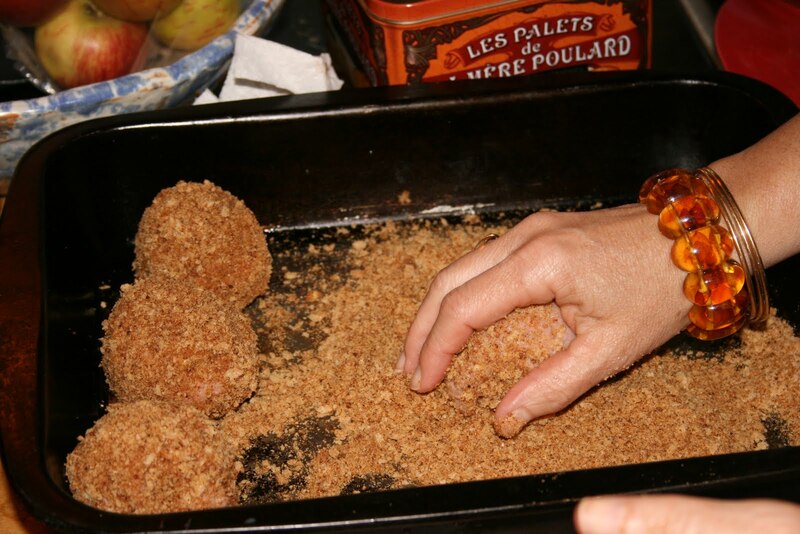 Prepare the bread crumbs – I make mine with dry toast in the food processor. I used two here. Then pour the crumbs on a plate. Put the raw egg in a bowl and whip with a fork. 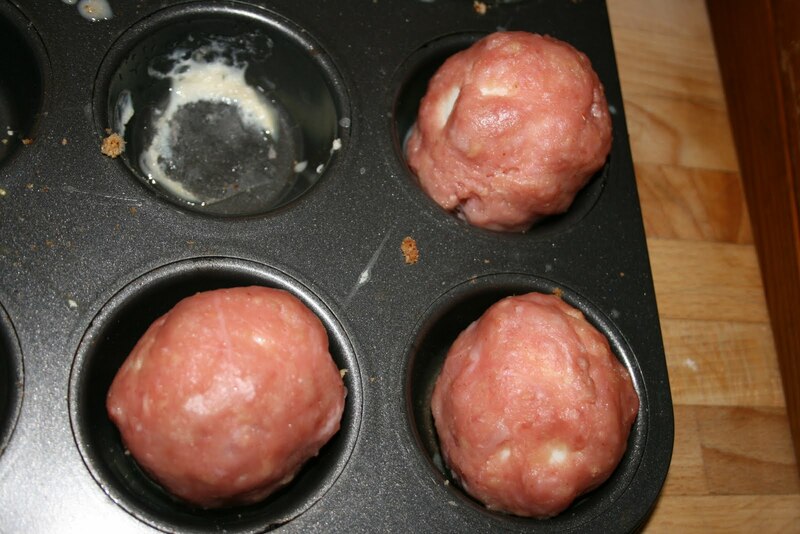 Take a golf ball size of sausage meat and patiently push the meat around the egg until it covers every bit and no white is showing. Be generous because the cover will shrink if too skimpy but do not make too thick a layer to start with- build it as you go. Use the egg mix to help stick together and do not worry about imperfections- they will be hidden! Let the balls dry a few minutes. Add a pinch of basil or origan to the crumbs. 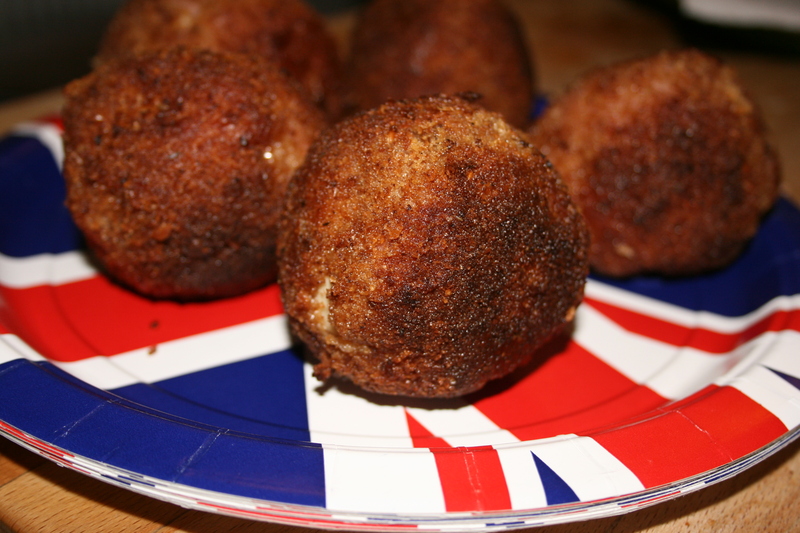 Roll each in the egg bowl and then on the breadcrumbs plate. Repeat two or three times until you have a thick and even cover. 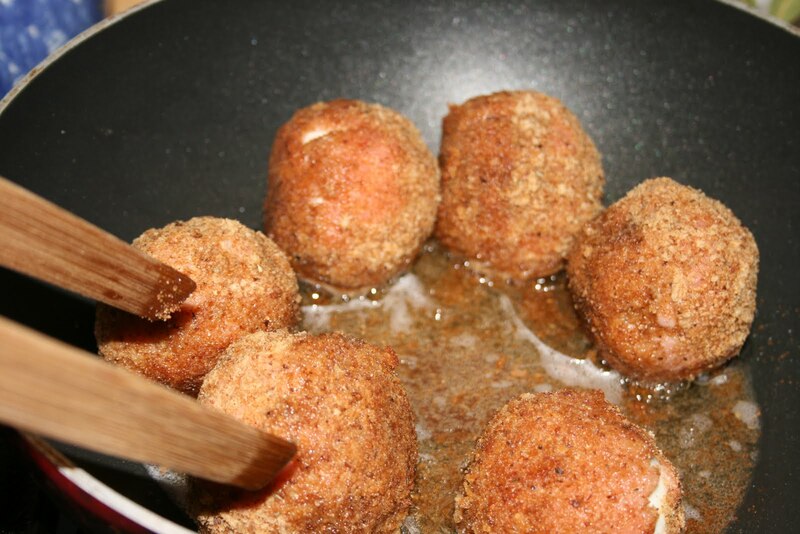 Heat some vegetable oil in a frying pan and shallow fry on all sides for a few minutes until the balls are nice and brown, the colour of a fox fur. Put 8 to 10 minutes in a hot oven to be sure the sausage meat is well baked. I have to say the whole week-end was just as successful and fun as this first attempt at making traditional pub food at home. 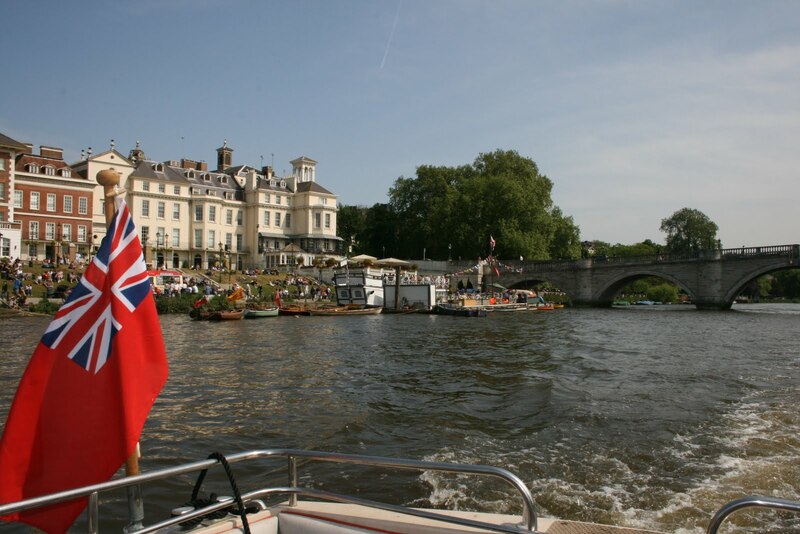 The river was quiet, the locks picturesque and the sun shined generously over our river trip. Picking up the boat in Hampton Court, we cruised upstream with a glass of Pim’s in our hand, glancing enviously at some very grand or cute river houses and many attractive house boats. We spent the night at the Weir Hotel near Sunbury lock, located right by the water and only accessible by bicycle or by boat. The rushing waters of the weir lulled us to sleep very quickly after a day in the river air. The children went to bed with nice pink healthy cheeks. 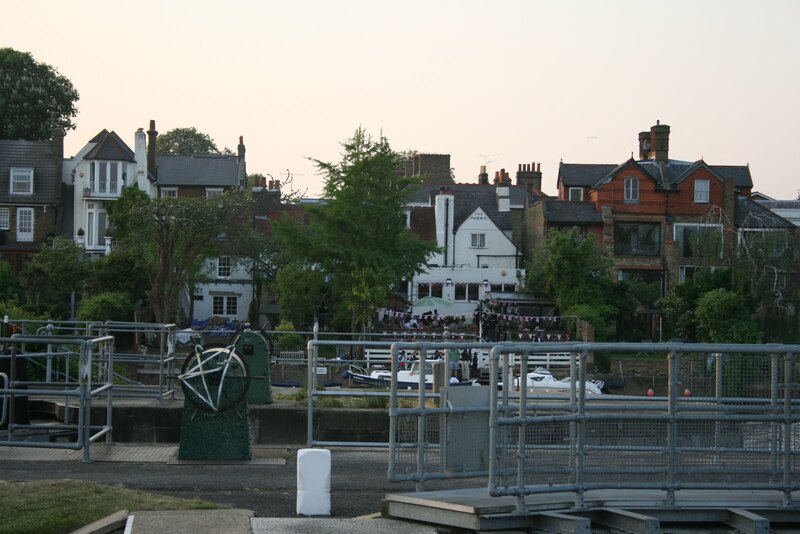 The next day we took the same trip down river and went through many quaint man-maned locks before passing Richmond and arriving at our final destination in Chiswick marina. We had done a famous part of the immortal trip of “Three men in a boat” and certainly had as much fun – Only the dog was missing, Camilla! This entry was posted in family favourite, spring and tagged eggs, picnic, river, snack. Bookmark the permalink.